Clear Lake, Colorado, taken from a bit to the southwest at Point B shown on the GPS map below. A beautiful lake in a glacial basin. The parking area is seen in the lower right. 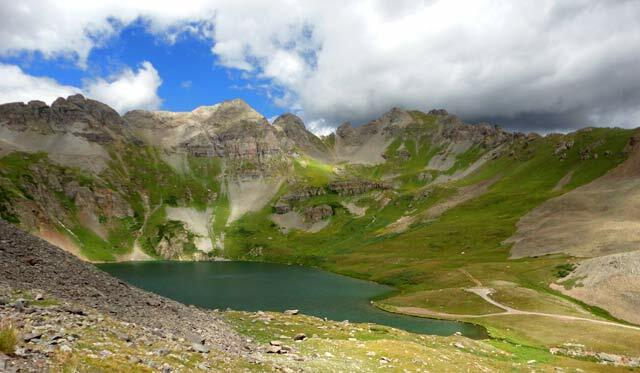 Clear Lake in San Juan County, Colorado, is a pristine example of a high (above tree line) lake in the bowl of a glacially-carved basin—I traveled there this morning. The lake is natural and is reached by traveling up San Juan CR 12 from Point A shown on the GPS map below. To get there, travel west from Silverton on US Hwy 550, then taking the Mineral Creek turnoff to the west, which is CR 7. At 3.9 miles in (Point A), you’ll see the cutoff quite clearly as shown below. The road to Clear Lake is San Juan CR 12, which takes off to the right--the Jeep is on CR 12. San Juan CR 7 continues to the left all the way to the trailhead for the hike to Rico. Sign for Clear Lake. To the right (up) is San Juan CR 12, up to Clear Lake. To the left continues San Juan CR 7 for several more miles. There are several Forest Service campgrounds along CR 7. You can access these in any vehicle. Going up CR 12 is another story. 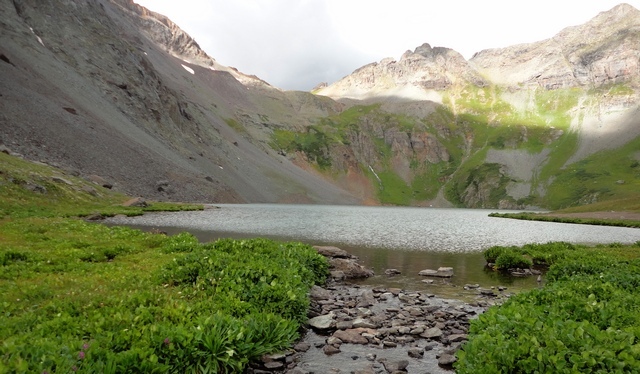 An Explorer or Blazer can make it most of the way up and you can hike the last half mile or so (but remember, you’re at almost 12,000 feet above sea level, so plan accordingly). Here's one of the views from San Juan CR 12 on the way up to Clear Lake. The road is rather steep. If you want to travel all the way to Clear Lake itself, you’ll probably want a high clearance 4WD, an ATV, or a dirt-bike motorcycle. I took the latter. The road up the last couple switchbacks gets suddenly rougher with more exposed rocks, not a hospitable place for lower-clearance vehicles. There’s some scree, too. As you get there, you’ll find a lower lake, much smaller. It appears not to have a name, so I’ll call it “You’re Not There Yet Lake.” Keep on going and you’ll find the lake. The view below is taken from Clear Lake’s outlet looking back across the lake. Clear Lake, Colorado, looking from the stream leaving the lake back up at the high glacial basin. The altitude is nearly 12,000 feet, well above tree line. The wildflowers are amazing—so many that I put them in another post. There’s a small parking area with ample room to turn around. Note that there’s a side road (shown as Point B on the GPS map below). I DO NOT recommend using this road with anything other than a motorcycle or a very competent ATV (or on foot) because there really isn’t anywhere to turn around. However, it does provide a spectacular view of the lake itself—that’s where I took the photograph at the top of this post. Heading back down CR 12, you have a nice view showing just how steep the last part of the road is. I had no trouble going down. Although there’s some scree, I took my time, then got past the first few switchbacks. After that the road gets much easier. Just as you leave the immediate viscinity of Clear Lake, you see this view. Yes, it's just as steep as it looks. Once down on San Juan CR 7, you can continue southwest for several miles to the trailhead for the five-mile trail that goes up over the divide and down into Rico. The GPS map showing how to get to Clear Lake is below. The intersection of CR 7 with US Hwy 550 is at approximately N37° 49.1′ by W107° 42.15′. The distance from the intersection of CR 7 and Hwy 550 to point A is 3.9 miles. Point A is the intersection of San Juan County Roads 7 and 12. From Point A to Clear Lake via CR 12 is approximately 4.6 miles. From Point A to the Trailhead to Rico is 3.3 miles. GPS map shows how to get from US Hwy 550, onto CR 7, to Point A. Turning up at Point A onto San Juan CR 12 takes you to Clear Lake. The last few switchbacks are scree-filled and probably not suitable for a low-clearance 4WD such as a Blazer or Explorer. 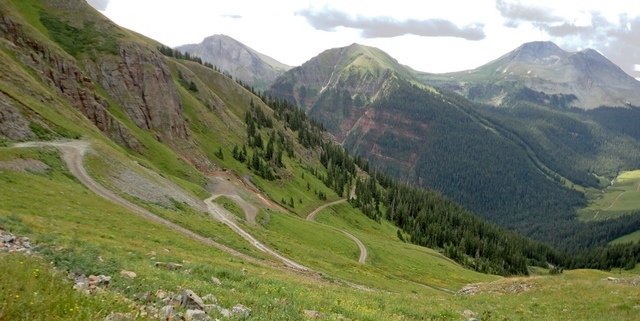 This entry was posted in GPS Tracks, Motorcycling, San Juan County and tagged Clear Lake, Silverton. Bookmark the permalink. I just wanted to say thanks for such a great description of the trip! Your description was perfectly detailed and the photos showed what to expect. Your site was the best out there. Thanks again! It is an awesome drive! I got up there finally last September after trying to get there many times in early summer only to be turned back by snow. Definitely a bucket list item for me. It was fabulous. Fishing was not good but everything else was terrific.